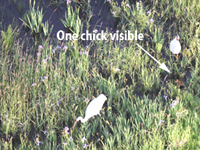 Group 1 chicks are captive-born. On July 20, the 11 chicks for Direct Autumn Release (DAR) arrived at Necedah NWR from nearby International Crane Foundation (ICF). 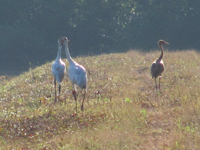 They were released Oct. 25 with wild cranes. 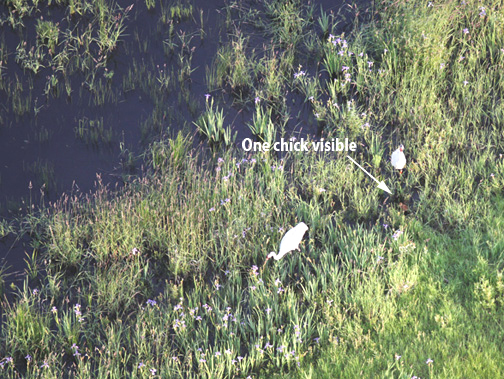 Group 3 chicks are wild-born. Their parents raise them and teach them to migrate. This is the natural way cranes learn to migrate. One day, this flock will be large enough for wild-born parents to take over. Then human-assisted migration will no longer be needed. Seven chicks hatched in 2010 in the Wisconsin wild. This was the largest number to hatch in the new flock's history. Wild-hatched chicks face many dangers in the first weeks of their lives, and by summer's end only W1-10 and W3-10 survived.They were flying by the end of August and better able to escape predators.